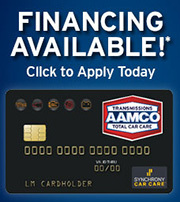 Before summer begins or if you're A/C is blowing hot air, come to a participating AAMCO center for a FREE check. We'll visually inspect hoses, lines, seals and other components for leaks, check temperature readings, check that your compressor is operating properly, and inspect the drive belt for cracks or damage. You may simply need a recharge of the refrigerant - or the inspection could call for other service, like a new compressor. Plus your air conditioning belt drives many other components in your vehicle, meaning a broken belt can have a much worse impact than simply an uncomfortable trip. It takes an expert to tell, so take your car to AAMCO and let the experts give you the peace of mind knowing that your vehicle will keep you cooler and safer. While your vehicle is at the center, an AAMCO certified technician will also perform a 36-point Multi-Point Inspection® Inspection. Your car, truck or SUV will get a thorough going-over to make sure all of the major systems are in good working order.